Waste Management, Inc. (WM) provides integrated waste management services in North America. The company offers collection, transfer, recycling, disposal, and waste-to-energy services. This dividend challenger has increased distributions for the past 7 years in a row. The latest dividend increase was in December 2009, when the company raised distributions by 8.60% to 31.50 cents/share. Over the past decade this dividend growth stock has delivered an annualized total return of 8.20% to its shareholders. The company has managed to deliver increase in its EPS from a deficit of $0.16/share in 2000 to a profit of $2.01 in 2009. 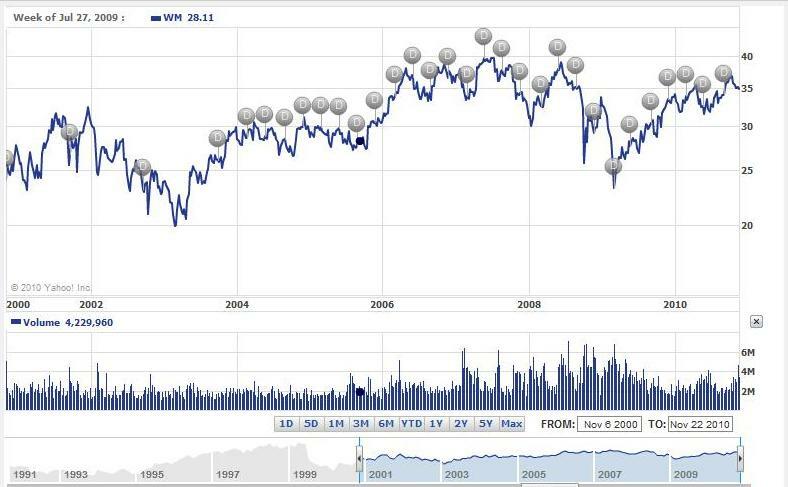 Analysts expect Waste Management to earn $2.05 per share in 2010 and $2.30/share in 2011. The company is a leader in waste management in the US. The waste the consumers generate would likely increase in the future, which should bode well for business. Future growth could also come from strategic acquisitions. The company also generates sufficient excess cash flows that it uses to cover distributions and stock buybacks. 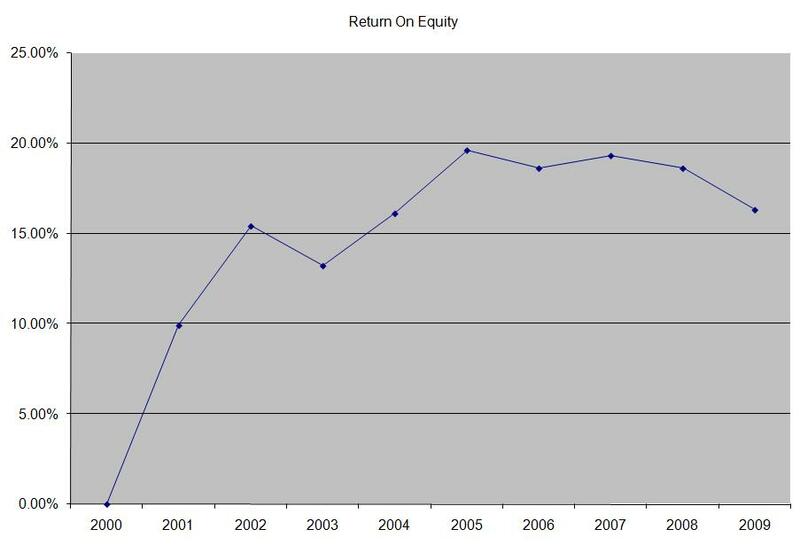 The company’s return on equity has remained above 15% for the majority of the past decade. Rather than focus on absolute values for this indicator, I generally want to see at least a stable return on equity over time. The annual dividend payment has increased substantially from one cent/share in 2003 to 31.50 cents/share in 2010. 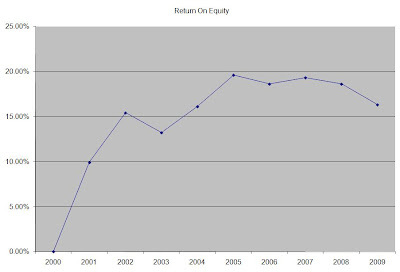 Since 2004, when a more generous dividend policy toward dividend investors was implemented, quarterly distributions have increased by 9% per year. The dividend payout ratio has increased over the past decade, reaching 58% in 2009. Based off 2010 forward earnings, the dividend payout would decrease to 61%. Waste Management seems to have reached the limit to its sustainable dividend growth. Without earnings growth over the next few years, future growth in distributions will be limited at best. A lower payout is always a plus, since it leaves room for consistent dividend growth minimizing the impact of short-term fluctuations in earnings. Currently, Waste Management is attractively valued at 17 times 2010 earnings and yields 3.60%. In comparison, rival Republic Services (RSG) yields 2.90% and trades at a P/E of 27. Given Waste Management's inability to grow EPS over the past five years, the high dividend payout ratio and the fact that the company is three years away from being eligible for inclusion in the dividend achievers index, I would rate it as a hold for the time being.